As long as you like hard-to-find Vietnamese noodle soups, you won't mind that the restaurant really only serves one dish a day. 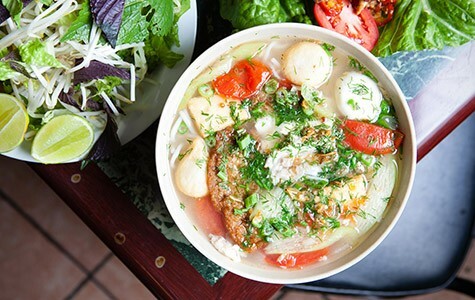 Bun cha ca, a fish ball noodle soup with roots in Hanoi, is the daily special on Fridays. Hours: Mon.–Sat. 11 a.m.–5 p.m.
You are undoubtedly familiar with the class of Asian restaurant that features a menu spanning several pages of tiny, single-spaced text and so many variations on the same handful of themes (noodles, rice bowls, barbecued meats, and so forth) that the mind reels trying to decipher what the true specialties of the house might be, and to assemble some semblance of a balanced meal. It can be a comfort, then, to eat at a restaurant like Cafe Kim Thuy, a tiny Vietnamese lunch spot that, with a couple of exceptions, only serves a single dish each day. Here, there's no question what the star of the show is: Soupy noodle dishes reign supreme — one for every day of the week, almost always a lesser-known regional variety. The restaurant's very existence is the latest sign that Oakland's Vietnamese noodle-loving populace is starting to branch out beyond pho. Cafe Kim Thuy is a sleepy-looking place, the shades pulled down more often than not, giving the appearance that the restaurant is perpetually closed. A small indoor koi pond is the most traditionally Asian decor element, but if you've spent enough time at this kind of OG noodle joint, you'll recognize many of the other accoutrements: the plethora of potted plants, the caddy of hot sauces, the absurdly large wall-mounted speakers (which, given that the restaurant closes at 5 p.m., speaks to the possibility of after-hours karaoke parties), and the YouTube video of midriff-baring Asian import models — projected onto a big flat-screen TV in a continuous loop during one of my visits. 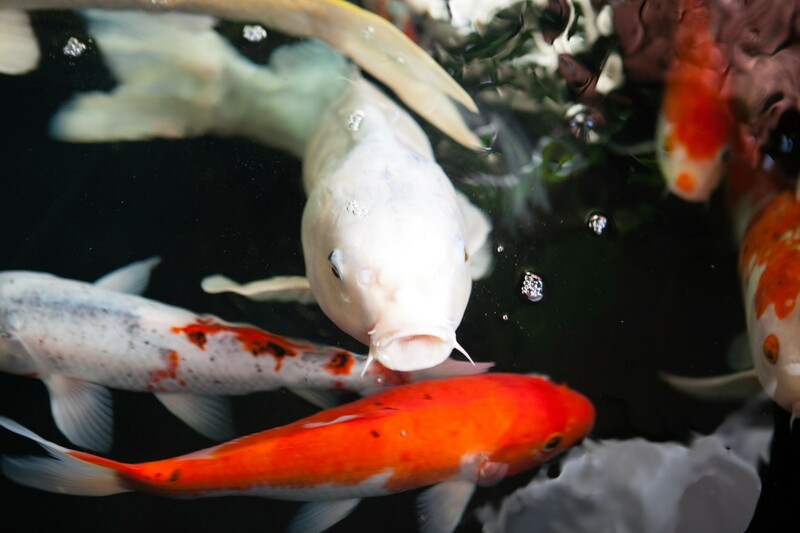 A small indoor koi pond is the most traditionally Asian decor element in the restaurant. Chances are, you haven't come to Kim Thuy for the ambience. Or, if you're like me and you prefer your Asian restaurants a little rough around the edges, you'll appreciate the atmospherics of, say, the older gentleman casually smoking a cigarette at another table. This is the kind of family business where a different auntie or cousin might wait on your table during each visit. But the heart and soul of the place is its namesake, Kim Thuy Do, the restaurant's self-taught chef. Do grew up in Saigon (aka Ho Chi Minh City), the daughter of transplants from the northern Vietnamese city of Hanoi, and credits her mother with teaching her how to cook. That background helps explain why Cafe Kim Thuy's menu, limited as it is to little beyond a single noodle soup for each day of the week, includes regional specialties from such a wide swath of the country. In particular, the restaurant serves a couple of Hanoi dishes I haven't seen anywhere else in the East Bay. If you only plan to give Cafe Kim Thuy one shot, let it be on a Friday when the restaurant serves what is both its best and hardest-to-find dish — bun cha ca, a fish ball noodle soup that has roots in Hanoi. Do's version of the dish features slippery, spaghetti-like rice noodles and a peppery broth made by slowly simmering chicken bones and a whole fish — either a striped bass or a catfish whose meaty flesh Do later takes off the bone to serve in the bowl. The dish was topped off with fried shallots, which infused the soup with a deep earthiness, and a flurry of fresh dill — a Hanoi signature — which added an herbaceous freshness. But the centerpieces of the bun cha ca were the tofu-like blocks of fish cake (which Do makes in-house) and the several varieties of toothsome fish balls of the sort you might buy at an Asian market for making hot pot. I was fond of the pointy-tipped ones that were shaped something like engorged Hershey's Kisses. Do calls these "surprise fish balls." Bite in, and you'll discover that they're filled with a slurry of bright-orange fish roe: a delicious surprise indeed. Kim Thuy Do is the heart and soul of the restaurant. On Wednesdays, the restaurant offers a very serviceable version of bun mam, the fermented fish noodle soup that hails from the Soc Trang province, near the southernmost tip of Vietnam. Cafe Kim Thuy's bun mam was more rustic and featured a sweeter, less pungent broth than the namesake soup at nearby Bun Mam Soc Trang, my gold standard for the dish. Even though this version wasn't as good, I was impressed by the sheer abundance of the toppings — the roast pork, catfish, shrimp, and squid. And the broth was tasty enough after I doctored it with fermented shrimp paste, adding a dose of salty umami to balance out that sweetness. 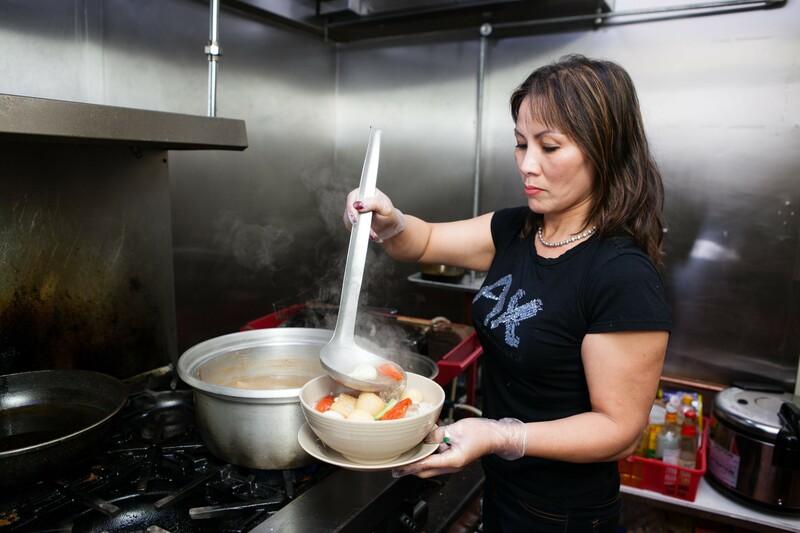 To round out the week, Cafe Kim Thuy serves bun rieu (a tomato-based noodle soup with crab-flavored meatballs) on Tuesdays, bun bo Hue (pho's more lemongrass-y cousin) on Thursdays, and beef stew curry noodles on Saturdays. And, although the daily soups are pretty much the whole show, there's also a short "daily menu" with a few interesting-sounding dishes — chicken pho and a Vietnamese chicken-and-rice dish, among others. But none of these ever seemed to be available. One exception was a rice plate with Korean-style grilled short ribs, which were decent — a serviceable lunch for someone craving red meat. 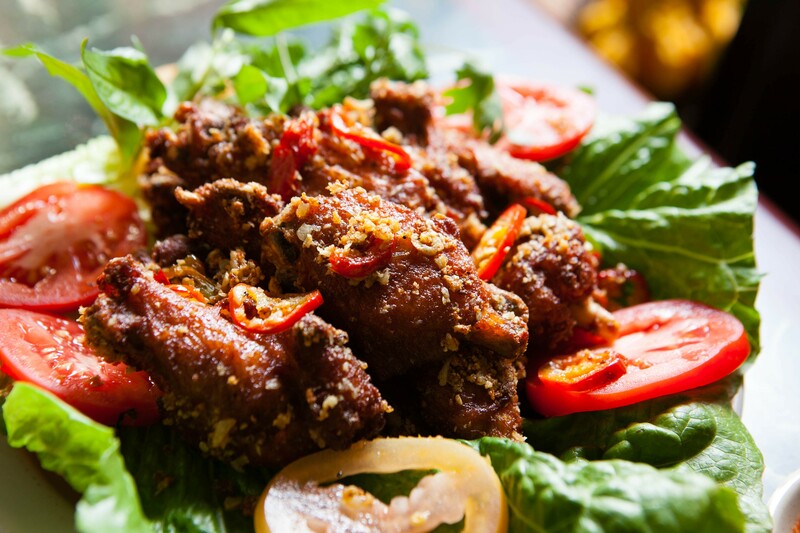 The standout, though, was the fried chicken wings, which were nothing like the sticky, spicy, fish sauce-heavy specimens that almost every Southeast Asian restaurant serves. Instead, these were seasoned simply with salt and pepper, with just a hint of chili heat. As plump and tender as you could hope for, each wing jiggled with little pockets of soft, delicious fat. A scattering of fried garlic added earthiness and crunch. The fried chicken wings were seasoned simply with salt and pepper, with just a hint of chili heat. At the end of the day, Cafe Kim Thuy has the kind of shortcomings you might expect to find at a small, understaffed, family-run place. Service could be a little bit haphazard. Items we were told weren't on offer during a given day turned out, lo and behold, to be available after all when we inquired about them again a few minutes later — alas, after we'd already committed to other dishes. You might have a hard time tracking someone down to settle your bill. But there's also a sincerity and a palpable warmth to a place like this. Especially for those of us who grew up in Asian households and had mothers (or fathers) who made this kind of food — not bun cha ca, per se, but some equivalent home-style dishes — the restaurant feels a little bit like home. During my first visit to Cafe Kim Thuy, I didn't realize the restaurant had yet to set up its credit card machine, and I wound up a couple dollars short. Do said I could just pay her back when I had the chance. When I promised I'd return the very next week, she smiled and said, "Good boy." That's the type of place this is.